Grimelda Purkiss waddled down Green Urchin Close. She pulled her shawl tighter as if to block out the foul smells of the narrow thoroughfare. She ducked to avoid a damp low-hanging sheet and tutted. Why the women of the Underground City chose to hang out their washing when they had no sun by which to dry it was beyond her. She turned the tight corner at the bottom of the Close and the object of her errand came into view. A bow window jutted into the alley, grime caked to each of its tiny panes of glass. A hand painted sign above the door read 'The Vault of Lost Voices'. Grimelda smiled. A bell jangled above the door as she stepped inside. The air smelled cool and clean after the warm squalor of the alleys and closes outside, and ornate lanterns blazed with blue flames either side of the door. Walnut shelves ran the length of the back wall, groaning beneath the weight of assorted bottles and jars. A black velvet curtain swished to one side, and a tall thin man appeared behind the counter. A mane of white hair clung to his skull, and a pair of pince nez perched on the end of his beak-like nose. He held out a bony hand. "Farridon Upworth, at your service. How may I be of assistance to you today?" Grimelda fished around in her bag and withdrew a slate. She found half a stick of chalk in her pocket, and wrote "I require a voice" on the slate. Farridon nodded, his expression suitably grave and serious. "I understand, madam. Here at the Vault of Lost Voices we pride ourselves on providing the very best vocal capabilities to our customers." Grimelda raised one eyebrow and wiped her slate clean. She scribbled a new message and held it up for Farridon to read. He frowned. "Well yes, it is true, we sell voices that have been lost but never claimed, but I assure you, we shall find the right voice for you. Now if you'd like to come closer?" Farridon gestured to a spot beside the counter. Grimelda stepped forward and gazed at the bottles and jars on display. She could see more shelves stretching away into the darkness beyond the curtain. It seemed many of the City's inhabitants were accustomed to losing their voices. "Now then. What kind of voice were you looking for?" asked Farridon. Grimelda wrote on the slate. 'Stately. With gravitas'. Farridon read the message and looked Grimelda up and down. She narrowed her reptilian eyes, convinced she saw mirth in his expression. He turned away and his shoulders hitched as he scanned the bottles on the shelves. She glowered at his back, though sadly he wasn’t the first she’d encountered who couldn’t look beyond her appearance. "How about this one?" Farridon turned back to her, forcing away the remnants of his grin. Grimelda took the bottle from him. The voice flickered behind thick red glass. She looked up at Farridon, and he motioned for her to open the bottle. The voice fluttered free when as she removed the cork, settling on her throat. "What do you think?" asked Farridon. "I'm not entirely sure this is what I wanted," replied Grimelda, her voice deep and rich. She screwed up her nose – she sounded like Senator Williams. "It is indeed a stately voice, madam." "Yes but I'm a woman. This voice is not a woman's voice." Farridon took back the bottle and flicked the fluttering voice free of Grimelda's throat. He captured it in the bottle and replaced the cork. 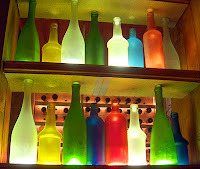 He returned the bottle to its place on the shelf, and handed Grimelda a tall blue bottle. She pulled out the cork and another voice appeared. It flew in lazy circles above the counter until Farridon forced it in Grimelda’s direction. “I don’t think it suits me.” The voice was high alright – too high. Grimelda envisioned one of the shrivelled City Mages, taking a week to make a single pronouncement. “Very well. Does anything in particular catch your eye?” Farridon removed the voice and put the bottle under the counter. He gestured to the shelves behind him, lips pursed and eyes narrowed. Grimelda pointed to a curvaceous silver bottle up near the ceiling. The voice inside sparkled in the lantern light. Farridon raised an eyebrow and pointed to the bottle. Grimelda nodded. Farridon let out an exasperated sigh and climbed a small ladder to reach the bottle. Grimelda scowled as he tossed it down to her. The glass was smooth and cold to the touch, and the voice made a beeline for her throat when she pulled out the cork. “Oh it’s perfect.” The silvery voice of an elf filled the room. Grimelda smiled – it sounded like sunlight on running water, the first snowfall of winter, and a nightingale’s lament rolled into one. “You wanted stately. With gravitas.” Farridon pouted. “I’m entitled to change my mind, Mr Upworth. How much will this one be?” Grimelda returned her slate to her bag, and rummaged in its depths for her purse. “That one is sixteen shillings. You may keep the bottle, too.” Farridon held out an expectant palm. “A bargain, Mr Upworth.” Grimelda dropped the coins into his hand. She prised free the voice, careful not to damage its gossamer wings, and swallowed it. She giggled, feeling it tickle as it took root. She crossed the shop and pulled open the door. The alley outside no longer seemed oppressive or noisy. Life itself looked different to Grimelda. She was different. She wasn’t the timid half-troll any more. Now she was the half-troll with an Elfin voice. Got a bit of a lovely post today since I'm able to tell you about two anthologies that are available for FREE on the Kindle, both today and tomorrow. 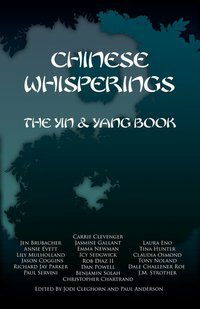 The Red Book and The Yin and Yang Book are part of eMergent Publishing's Chinese Whisperings project, and you'll be able to pick them up for the princely sum of nothing. My story, The Strangest Comfort, appears in the latter. "Each anthology is a collection of interwoven short stories by emerging writers handpicked from across the English-speaking world. Unlike other anthologies, Chinese Whisperings is created in a sequential fashion and each story stands on its own merits while contributing to a larger, connected narrative. The Yin and Yang Book takes the concept a step further, with the anthology played across parallel airport universes stemming from a decision to retrieve a stolen painting or to leave without it. It's a sliding doors/spider web hybrid. Readers will see common characters slipping across the two universes, some of them behaving in slightly different ways. The parallel universes are anchored between a common prologue and epilogue." You can pick up The Red Book here, and The Yin and Yang Book here! 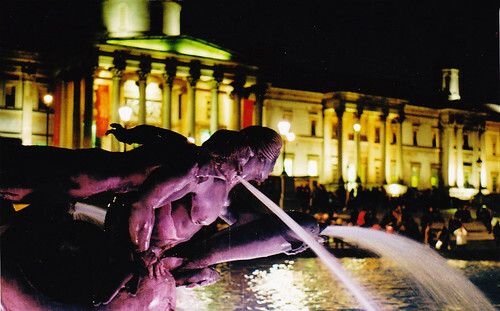 The 85th prompt is Trafalgar Square.